WE DO NOT CHARGE ANY GRATUITY OR SERVICE FEE.....EVER!!! We specialize in the Polish American menu, including, but not limited to, our famous roasted chicken, kielbasa – Polish sausage (a very old and well known Westside recipe), whipped potatoes and gravy, kluski – Polish noodles, kapusta – sweet and sour fresh cabbage, green beans and carrots, and fresh dinner rolls, coffee, milk, and ice water. This is served family-style, all you can eat, at $14.50 per person. Linen Service – thick and high quality. 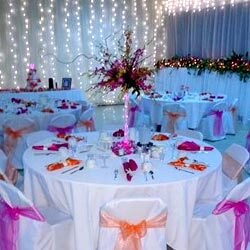 All of our functions are more formal and so we offer a linen service, including white tablecloths and linen napkins that come in an array of colors to coordinate with either your primary or secondary color theme. We also provide white imported china from Poland. Linen service is $ 1.50 per person for our banquet tables which seat up to 20 per table. Round tables are also available per table of 10 and linens are $2.50 p.p. Chair covers with your choice of color ties $2.25 p.p. (need totals 3 wks in advance). Special Event Insurance: insurance policy for $95.00 for your event. This is manditory to cover your event. We are also well known for our pies, the most popular are the whipped assortment – chocolate, coconut, banana, and lemon meringue, strawberry, turtle and oreo cookie. Dessert service is $1.00 per person. FRIDAY DECORATING FROM 7AM UNTIL 2PM. BAR is a max of 5 hours. 1 hour before dinner, shut down during dinner-1 hour, then open 4 hrs. OPEN BAR: $9.50 per peson. Your guests drink at no charge. Well liquor that includes whiskey, rum, vodka, gin, peach schnapps. Mixers are: bloody mary mix, tonic, club soda. Pop is coke products. This also pays for professionally licensed bartenders and all bar sundries (fresh limes, cups,swizzle sticks, napkins, and ice.) 5 hr max. Security Guard -- $100.00. This covers 4 hours. They are policemen. NO GRATUITY OR SERVICE FEE EVER CHARGED! Setup offers two eight-foot oblong tables, with a four-foot extender, which seats twenty per table. Round tables are set up for 10 per table. Risers for the head table, microphone, lectern, and ballroom light along with our planters with white LED lights, and white LED lights along all the walls which come standard with the hall. We now offer up-lighting for an extra cost of $300.00 east hall $200.00 west hall. There are 7 colors (light blue, malibu blue, purple,yellow/lime green, dark green, white, red). Those go all around the hall plus under headtable, cake table and gift table. Decorations: patrons are free to decorate as they wish, noting that we allow nothing hung from our ceiling or attached to our walls or nothing put into our planters. Free standing decorations are welcome. The Center opens one hour prior to serving dinner and closes at 11:00 PM the day of the function. You have until Midnight to remove personal effects. Friday decorating is available, 7 AM - 2 PM. both Halls – 800 ($850). Fees include full set-up and full clean-up. MONEY ORDER OR PERSONAL CHECKS ONLY. WE DO NOT ACCEPT ANY CREDIT CARDS! A non-refundable $500 security deposit is due upon signing the contract; it is applied toward the total bill.